ANNAPOLIS, Md. — There was a packed board room for the April 5 Rural Maryland Council’s spring executive board meeting. RMC’s executive director, Charlotte Davis, and her staff assist agencies applying for grants to fund local and regional projects. A variety of these projects were featured at the meeting. Maryland Secretary of Commerce Kelly Schultz was the guest speaker at the board meeting. Almost $700,000 has been budgeted by the state of Maryland for grants through the MAERDAF program for 2020. The maximum disbursement for any single grant is $40,000. 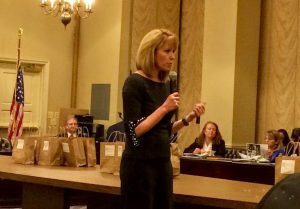 Guest speaker at the meeting was Maryland’s Secretary of Commerce Kelly Schulz. Her theme was cooperation and coordination. Schulz explained how the Department of Commerce has established collaborative sub-cabinets, teams of regional liaisons whose task it is to go out into the regions and communities, and meet with the folks who live and work and farm in each region. From these collaborative meetings will come information about economic, political and social priorities. Communities and their organizations can tell the representatives from the Department of Commerce what’s important to that community and what priorities they have. The regional liaisons bring that information back to the department’s monthly meetings where programs and solutions can be devised. Further building on that collaborative approach, Schulz explained that internally, the department is encouraging its Offices of Economic Development and Tourism to work together as well. As an illustration of the power of collaborative effectiveness, Schulz spoke briefly about the youth and adult apprenticeship programs being fostered throughout the state. Roxanne Wolf, executive director of Shore Gourmet, also addressed the group. She is spearheading a project for the Caroline County’s Community Development Program. Wolf explained the evolution of the medicinal herbs project. The Shore Specialty Growers Coalition is piloting programs to grow various exotic herbs for sale, for example, Aronia for an Eastern Shore version of the now-popular Matcha tea. The pilot programs have run into problems but have found solutions. The growers are collaborating on the science, the research, the production and marketing. The program in Caroline County is an example of just the collaborative atmosphere that Gov. Larry Hogan, the RMC and the Department of Commerce are encouraging. Supported by the RMC is another project focusing on biomass as a fuel source. Representatives Joanne Ivancic, of Advanced Biofuels USA, and Robert Kozak, Atlantic Biomass, LLC, explained the use of specially bred sugar beets that can be processed to produce fuel instead of sugar. Research indicates that these beets will produce more fuel and less biomass waste than corn. In fact, researchers are working on recycling the waste from the beets, which is high in protein, as chicken feed. Ross Peddicord, executive director of Maryland’s Horse Industry Board, is proud of another project initially supported by the RMC. Fair Hill Equestrian Complex in Elkton is being completely rebuilt and expanded. Fair Hill is already designated as a “3-Star” equestrian event location. The Equestrian Center will be hosting an Olympic trial “3-Day Eventing,” a triathlon, of sorts, for horse and rider. The report from the Maryland Rural Prosperity Investment Fund’s co-chairs, Susan O’Neill and Matt Teffeau, announced that $10 million of the new budget has been set aside for the Rural Broadband project. Erroll Mattox, chairman of the Agriculture Committee, spoke about the work being done to remove the roadblocks facing hemp farmers, specifically processing infrastructure. Mattox noted the potential financial benefits for Maryland’s farmers and the need to support those farmers. The RMC Rural Summit will be held on Dec. 12 in Annapolis. View the original news article here.